Use penmanship to teach biblical truths to your student! Horizons 4th Grade Penmanship perfectly interweaves cursive writing practice with important lessons from Jesus' Parables. Engagingly illustrated lessons cover: tracing letters and words, defining words by using them in a sentence, practicing printing sentences, and writing sentences to answer questions. Examples of timeless parables are: The Parable of the Good Shepherd, The Parable of the Lost Son, and The Parable of the Mustard Seed. 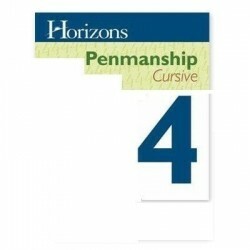 The appealing Horizons 4th Grade Penmanship Set includes: one student book with removable pages and one corresponding teacher's guide. These materials may be purchased individually. The teacher's guide includes: a lesson planner, duplication masters, answer keys, teaching tips, and additional worksheets. This bible-based course contains 160 student lessons.